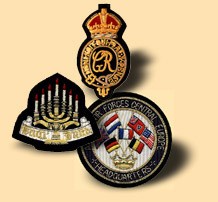 Our badges are of the finest quality using either silver, gold bullion or silk wire. We hand-embroider our badges, crests and emblems. We also manufacture special badges and insignia such as skills badges, rank badges, hat badges, crests for blazers and heraldry coat-of-arms. Our products are ideal for such organizations as sports clubs, schools, industry, fire prevention, law enforcement and ambulance services to name but a few.